Planning your academic success is the same as planning for your future. The free 2016-2017 Academic Calendar is a tool that’s here to help you plan everything out each and every semester. Unlike many other templates, this document is fully customizable and is here to help you plan out your school year, one step at a time. With color-coordinated charts and easy to follow structures, this template is by far the most comprehensive tool you will use all school year. Never again forget an exam or leave behind your homework, this template has you covered on all fronts. To learn how to use and download this free template, just follow the guide below. Click the link below to download the 2016-2017 Academic Calendar. Now, go the right of this template and take a look at the color code table given. You can change this to whatever you need. For example, red could mean you have an exam that day. When you enter it into the main table, you will see that you have an upcoming exam, weeks in advance. Below the color table is space to enter the current date. The template will automatically restructure to the new month. Next, enter your important item in the correct month, under the list of tables below the calendar. There are a few examples provided so you can see how it works. When you have the item and the date listed, mark it on your calendar with the corresponding color. If you need to list something of importance for that month, you can do so in the handy “Notes” table as well. 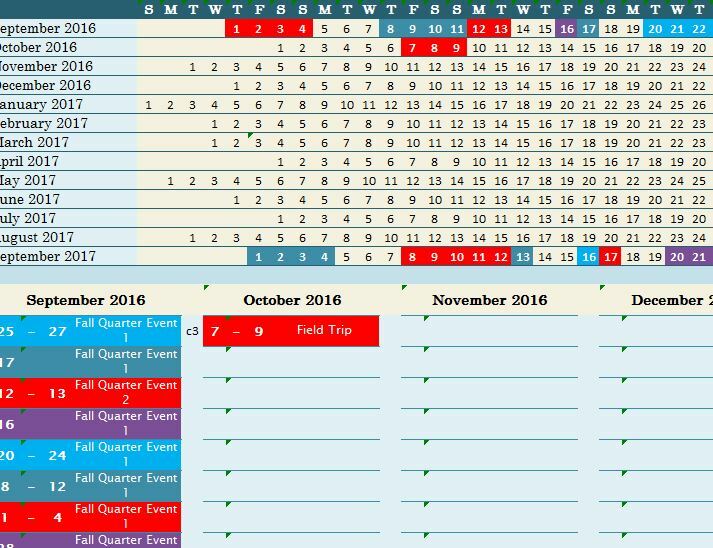 Using this free template, you will be able to organize your school year over and over again for free. Thanks to all our wonderful fans for submitting their templates for us to fix and add to the collection. We Love providing people with free information, guides, and templates that allow you become more productive and efficient in your tasks, make beautifully personal holiday cards for friends and family, and even shed some pounds for the summer season. We thank you for your years of patronage and hope you keep coming back for our growing connection and community.